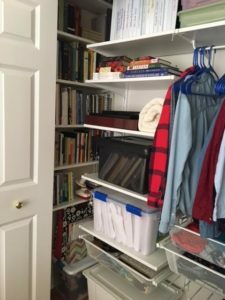 We are continuing to settle into our new home–and getting ourselves organized. 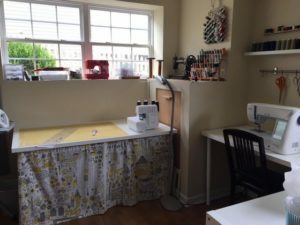 I started with my sewing area in the basement. I bought an Ikea Kallax 8-bin unit to define my space and set up a boundary with the kids’ play area. Bins organized toys and fabric and an attached table made a nice home for my new sewing machine. I returned to Ikea for another table for my serger and a cutting board, and an even bigger–16 bin–unit to store my fabric. 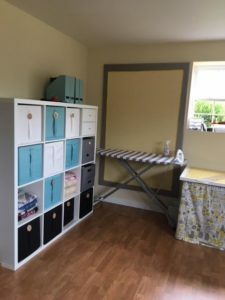 A re-covered design board, a new ironing board cover, and a table skirt to hide more bins of stuff, completed my sewing room by mid-July. 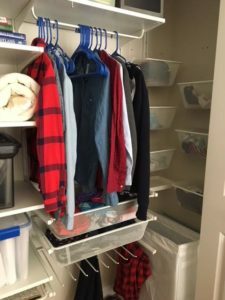 With Lizi moving back home, I organized the closet in her room to compactly hold–and organiez–her clothes and my (non-sewing) hobbies. I needed to cram a lot of books and files into a small space. Back to Ikea (several times) to pick up pieces of the Algot system and figure out how to use the space well. 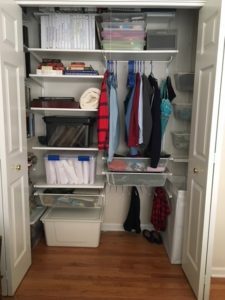 I finished our new, organized closet by the end of August. 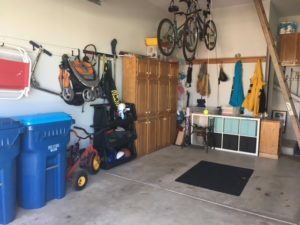 Last, but certainly not least, we were able to get our garage organized by the end of September. Another Kallax system and more bins, a massive workbench and pegboard, and numerous shelves. Our bikes are stored up high on pulleys for easy access and sports bins hold the balls, discs, and skates. A rail system holds gardening tools, etc. Plus we either stored (garage attic) or threw out the rest of our junk. Today was one of those days. I left work early and decided to stop at a quilt store and Ikea, “on my way” home. On the spur of the moment, I stopped to visit a friend near Ikea. And then I set my GPS for home. I meandered through a bit of what I call “suburban hell,” curvy roads through the suburbs that catch you in their tangled webs. I meandered past a lot of fields and industry. Before I knew it, my GPS had me meandering right past the farm where Laura and Taylor pick up their CSA vegetables every Friday. A light went on: We were supposed to do the pick up today. I called John to see if he had remembered (he didn’t) so I pulled in and was able to get our weekly supply, just moments past the regular closing time. And then I meandered home. Right, left, left, right. Farm fields and housing developments. And then, I was on Hafenrichter, one of the streets bordering our subdivision. Home–with a smile on my face. What a lovely commute. P.S. The sun was shining and the top was down on my convertible. I’m sure that had something to do with my happy feeling. Olaf’s song, “In Summer” keeps going through my head, especially that last belted-out line. 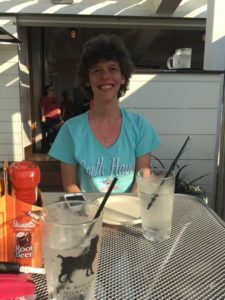 Lizi and I enjoyed a taste of summer for a few days at Balgownie, the Bendelow’s cottage in South Haven. It was hot and sunny most of the time we were there, perfect for a few beach days to start off the summer. Returning home last night was a little weird: I drove home via I-80 and then up Rt 30, through farmland and fields for the last few miles, then came into our subdivision from the south, avoiding the busy roads that I’m used to transversing. When I got home and unpacked, I had an odd feeling of surprise that this was actually my home. It feels a bit like a summer home with the light, bright basement, the deck(s), the lush grass, and the big blue skies. No pool, no lake, but still summer-y. In a week, we’ll have a small body of water on our property: We bought a new hot tub and it should be installed this weekend. 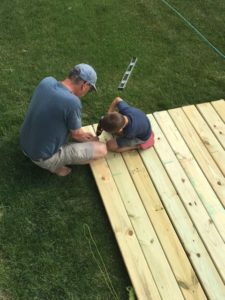 John has been busy planning a second level deck and building the base for the hot tub. He also is installing the electric wiring from the house to a circuit box and then to the tub. In the next few weeks, he will put in a fence and later this summer, build the deck around the hot tub. He has good helpers. In the meantime, we’ve enjoyed eating and entertaining on our deck. When we first bought the house, John thought the deck was too big. He planned to cut it down by about a third, knowing he would be adding a second deck for the hot tub. But as we have lived with it, we find it is not too big at all! Tables, chairs and people fill it up just fine. My gardening plan for this year was limited to the area just outside our front door. It looked like the previous owner had simply put mulch down, never developing the soil or planting much but bushes across the front of the house. I was dismayed when I started to dig (thick clay) and disappointed when we paid to have it rototilled with added compost. It will be a work in progress for a few years. I planned to wait until next year to add a garden for vegetables and herbs. However, my new neighbor to the north has four terraced raised beds on the south side of his house, facing my kitchen window. I asked him if he was planning to garden and he said he didn’t know much about gardening. I asked/offered to work on it for/with him. I dug out weeds today, will add compost tomorrow and hopefully have it planted by the weekend. I brought several plants with me in pots that need to be transplanted. It felt good to be digging in relatively good soil today–a definite sign of summer. I have a feeling summer will fly by while we continue to settle into our new house. That’s okay because we are planning on a second summer in December/January and possibly February: New Zealand! Meanwhile, we plan to enjoy our new house…in summer! 1. I like my kitchen. Actually I’m finding it simply amazing (without being over-the-top.) It is big, open, and has tons of storage. It’s been fun having people over for dinner and it really is a good thing that I like my kitchen/dining room so much because it is the only place we can sit down inside the house. 2. I like my island. It has become a comfortable place to cook and feed others, but it is also my place to sit and read or plan, or work on the computer. John has his office and I have a loom room/sort-of-office, but I find I gravitate to the island for most of my quiet moments. 3. I like our deck (when the sun is shining.) Even though we are planning to make some changes to the deck (a second level with a hot tub 🙂 we’re enjoying what we have for now. 4. I like our very first master bedroom/bath. Our master “suite” is really four rooms: a bedroom, a bathroom, a separate toilet room, and a walk in closet. The bathroom has a shower and a deep whirlpool tub tha is helping me get over the temporary loss of a hot tub. 5. I like our first-floor laundry. Way cool. 6. I like our garage. So far it is a staging area for unpacking, but we are gradually getting things put away. John built triple decker shelving along one wall of the garage, which lets us store things, basically in view. 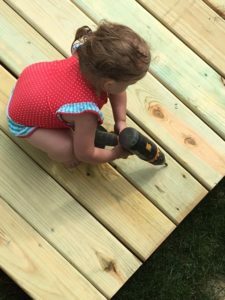 His next project is a workbench. 7. I like our “lower level.” We are working on dividing the big room into sewing area /play area/ and place to relax together with friends. 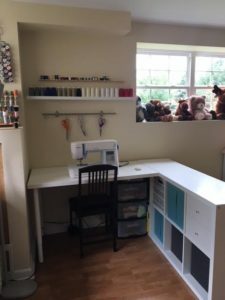 Last week I made a trip to IKEA and set up a desk and bookcase to make a separate space for my sewing. This week we ordered a sectional couch for the other end of the room. These two spaces bookend the kids’ play area but they all kind of flow together. John2 has a bedroom and a large “media” room that we are letting him take over. 8. I like our neighborhood. It’s really different, but pleasant. I’ve become a dog-walker, enjoying looking at the different homes, gardens, etc. There are ponds and paths and miles of places to walk. It’s not like Elmhurst, where we could walk to town and ogle some really big and beautiful houses, but it’s open and quiet. I like that we routinely pass farm fields as well. Our new neighbors seem nice. I was especially happy to find that one of my nursing school classmates, Cheryl Fornelli, lives just two blocks from us. We had fun getting re-acquainted with her and her husband, John. 9. I like our new town: Aurora. It’s really diverse and interesting. It’s sprawling suburbia mixed with a downtown area that is struggling to survive. An Elmhurst “kid” told me that we have a cool venue in River Edge Park. Today we got a flyer for the Summer Concert Series. (Our own Ravinia?) Aurora has miles of bike trails, lots of parks, a small zoo, and Blackberry Farm. Aurora is also home to Wayside Cross Ministries, where John has volunteered as a mentor and occasional teacher/speaker. 10. But best of all, I really like being near Laura and Taylor, Kellen, Oaks and Olive! It has been a lot of fun to share our lives and our new home with them. Besides babysitting and casual drop-ins, we were able to enjoy the end of the soccer season, seeing our kids at church, and taking field trips with them. Laura and I are also co-cooking: we plan our meals and double our portions so we don’t have to cook every night 🙂 Loving that! Remember The Big Hole and the Taj Mahal? Our new neighbors moved in this week: a single cardiovascular surgeon, accompanied temporarily by his mother. We just got home from having Chicago style deep dish pizza with them. Naz is my new best friend. Last Friday she wanted to make us a Pakistani meal so I gave her a ride to the grocery store so she could pick up the ingredients. She came home and cooked mounds of chickpea rice, chicken, and a tomato/onion relish. Her son told us she Americanized it for us. She has been unpacking while I have been packing, which has worked out wonderfully as they are giving us their empty boxes and packing paper. She also wants to take me out for lunch before I leave and her son has invited us back for a lamb dinner in a few weeks. We traded cell phone numbers tonight. We are T minus three for blast off: By this time Thursday, our house will be empty (and “broom clean”) for the walk-through. I may come back afterwards for one more soak in the hot tub. We will still own the house until mid-morning on Friday. By early afternoon, we will own another house and will move in over the next few days. I can’t quite imagine what it will be like unpacking all this stuff that I’ve been putting in boxes for months. It might be a bit like Christmas. In a few days, we will be the new neighbors. 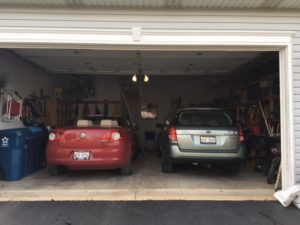 We know that the neighbors on the north side of our house just moved in a couple weeks ago so it will be interesting to meet them and see if we can connect as easily as we have with Oz and Naz. We will have to work at making new friends, and be “intentional” about keeping the old. One is definitely silver; the other gold! We bought a house in the burbs! After our lost bid, John spent the next day (while I worked) researching and looking at houses. He found a ranch that he said was “nice, but no glamour–functional, light.” It’s selling point was that the basement was entirely finished and very light and sunny. We looked at it again the next day and also looked at another that had a lot more glamour but a completely unfinished basement. It also smelled like a smoker lived there. We ended up going back and forth between the two, choosing the finished basement, clean home (the previous owner’s wife had problems with allergies so it was the polar opposite in air quality) and ranch style, which seemed wise for a couple in their mid-60s. It’s a little boring, but I’m looking at it as a blank canvas. There is very little work that needs to be done, so we can concentrate on making it our own in other ways. It is also relatively new–only 11 years old with one owner. This will be a new experience for us as we have always lived in old houses (with the exception of the duplex in Alaska.) 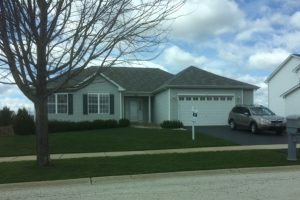 It has a brand new furnace and air conditioner and a clean 2-car garage. The main floor walls are all white and the “lower level” is a pleasant yellow. (My friend said it shouldn’t be called a basement.) 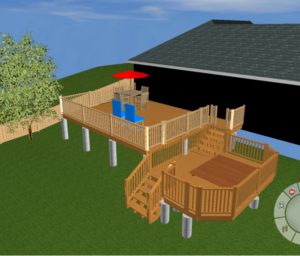 The deck is functional but uninteresting and the yard is mostly undeveloped, but sunny. The kitchen/dining room is large and open, a huge contrast to the claustrophobic kitchens I’ve had in the last two houses. I haven’t measured yet, but I think there must be a good 16-18 feet of countertop compared to what I have now and lots of drawers and cabinets. It will be our first house without a separate dining room, which I think will be a nice change. It also has a small island with a “breakfast bar.” The entire room, including the dining area, is 16’x20′. P.S. Today is our 40th anniversary! The proscribed gift for 40 is a ruby, but I think this is better. On Christmas Eve our pastor spoke about the mess of Christmas: of Jesus’ birth in a messy stable cradled in a feeding trough; of the difficulty of keeping plastic Jesus in the manger at his Indiana pastorate; of the reality that Jesus didn’t stay in the manger and he didn’t stay on the cross; and the truth that he comes–Immanuel–into our messy lives as well. 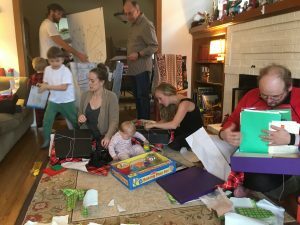 This Christmas season felt messy and Christmas day was definitely chaotic. 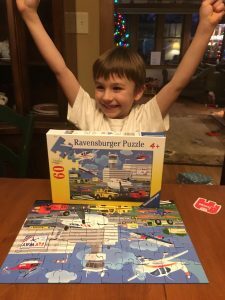 Our Last Christmas In The House was fraught with expectations, our house was FULL, and on top of that, we planned a family trip to Disney after the New Year. I decided not to give my adult children gifts since we were going on the trip (which one adult child thought was a very bad idea.) Three weeks ago, our travel plans changed (only half the family is going) and other family drama marred the preparations. When I first started unpacking my Christmas decorations, I spent time placing my nativity scene on the top shelf of the curio cabinet. John and Johnny bought it for me years ago, and while I’m no longer a fan of Precious Moments figurines, this one is special. A papa sits in an armchair next to a fireplace reading the Christmas story to his little boy, illustrated in the manger scene of figurines of the main characters, cute sheep, a donkey and a pig. An angel with a flashlight shines his light down on the manger, an added piece that I bought the Christmas after a miscarriage. On the shelf below, I put an earthenware communion set that I asked a friend to make for me years ago. Laura and Taylor used it at their wedding and I’d been saving it for the day when our entire family was truly following Jesus. 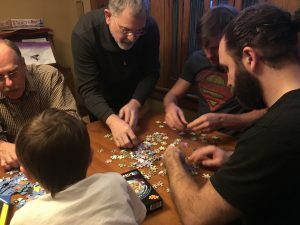 As I placed the pieces, I decided that we should stop waiting for that elusive day and serve communion this Christmas–no matter how messy our lives were looking. So for a very few minutes, we sat around the table eating cinnamon rolls and talking about our faith and our Savior. Oaks said he wanted to pray and we smiled while he prayed for “all the children to have power, all the power…” Kellen, prompted by his parents, explained why Jesus came and died for our sins. John and I both got choked up when we talked and others shared their gratitude for friends, family and church. We listened to a music video of O Come, O Come, Immanuel and then shared simple bread and grape juice. Short but sweet. And then we went back to the chaos and the mess, both literally and figuratively. I was exhausted by the end of the day, vowing to never be in charge of Christmas again. There were huge messes everywhere, in the kitchen, dining room and living room. The top of my mantel was crammed with “stuff”, a pet peeve of mine. And oh, in between our two meals, the sink/disposal backed up so John, Taylor and James worked their magic with a plunger and a snake. Not pretty. But Jesus was here–God With Us–in the midst of our mess. We might have only noticed for a few brief moments, but we walk by faith even in those times when we don’t sense his presence or lean on his goodness. Merry Christmess! “We’re down in Indiana, at Cedar Lake. Yo-ho! We’re feasting on the manna, to the promised land we go. We’ll raise a loud hosanna and happy hours you’ll know. On Thursday, Dad’s birthday, I once again visited Cedar Lake. My mission was to find out more about the summer home my grandparents purchased in 1925. Cedar Lake is in the back story of a Marshall legend. My grandparents, Robert and Janet Marshall, had purchased a summer home near Cedar Lake. I knew that it wasn’t on the grounds of the camp, but somewhere in the area. For years I’ve intended to visit the Lake County Courthouse in Crown Point to hunt down the home that were living in on June 30th, 1925. I found the Recorders Office several miles down the road in the Lake County Government buildings rather than at the Courthouse in the middle of town. The first three people I met were not very optimistic about my search, but I persisted and found the deed for their purchase on June 26th, 1925. They bought the cottage on a Friday and must have started moving in right away. I’m guessing they spent the weekend there and settled in to spend at least part of the summer away from the city. Robert planned to commute back and forth to East Chicago, in his hard top touring car. She knew that nothing would ever be all right again. Her father was dead! Dead. How could that be? No matter how many times she went over the story, it always turned out the same: She had been helping Mother prepare supper in the small cottage kitchen. They heard a car pull up in front of the house, and stopped to take off their aprons before greeting Dad at the door. Only it wasn’t Dad. It was two men from the conference who had come to tell Mother the awful news. Jean saw her mother’s hands fly up in the air and heard her anxious questions while she tried to absorb the news. The car hit by a train and dragged down the track. A fire. No one could have survived the crash. Yes, they were sure it was Bob’s car. Yes, the police and fire department had come. Yes, he was in heaven now. No, he wouldn’t be coming home to the cottage or home to his family ever again. Then Mother had insisted on going to the scene of the accident, about a twenty minute drive from the cottage. The men hesitated and tried to talk her out of it, but she had insisted that she needed to see it. The children were too young to leave behind so they were bundled into the vehicle as well. 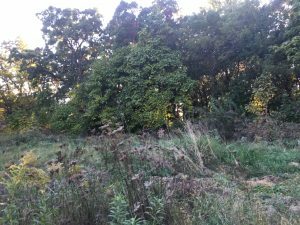 There at that barren corner where the tracks crossed the Calumet highway, Jean had huddled in the back seat with her two little brothers, scared, shocked, unbelieving. There really wasn’t much to look at. The car was a mangled, burned mess off to the side of the track. The train was long gone. The police and fire trucks had just pulled away. One lone policemen led Mother by the arm, explaining what he knew about the accident. A car had stopped for the oncoming train, but father had pulled around it and tried to cross the tracks ahead of the train. He hadn’t made it, crossing directly in the path of the Scotsman flyer. There had been a terrible screech and explosion as the train impacted the car and dragged it further down the track. The machine had burst into flames. Jean watched as her distraught mother wandered around the site. She saw her bend down with a handkerchief, pick something off the ground, and put it in her pocket. Finally, Mother returned to the car and they went back to the cottage where they immediately began packing their belongings. The would return to Chicago in the morning. . Weeks later, when it was all over; when the funeral was done and Father had been buried next to Agnes; when they moved back home to their apartment on Green street, Jean asked her mother what she had picked up that day. When I shared Aunt Jean’s story with a friend, she asked if my Gramma was being sarcastic. I immediately said “no” but the more I thought about it, the more I believed that she was expressing both shock and anger. Robert made an impulsive and foolish choice that day, a choice that would impact his family for years to come. My father was born four months later. I don’t know (yet) what happened to that cottage. I was able to locate an address and get a copy of Real Estate Assessment and Transferred Records, but they only go back as far as 1958. Even so, there are hints of more story: the first name on the record is Mary R Christie, a sister-in-law of Janet’s second husband. Her son’s name (a nephew) is in the top left hand corner of the document and Lawrence’s name is also on the original deed as the notary public. More puzzles to unravel. I did find the land, but no cottage. There was even a For-Sale (“Best Offer”) on the ground. 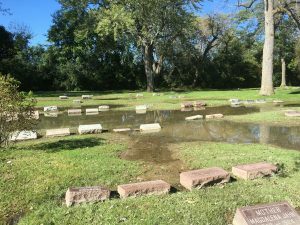 Speaking of land, I’d also stopped at Mt Hope Cemetery on the far south side of Chicago earlier that day. The final resting place for Robert Marshall (and two of his children) is an unmarked grave in a back corner of the cemetery that isn’t cared for well at all. I ended my day, somewhat coincidentally, at Palos Hills Christian Assembly, the Plymouth Brethren off-shoot of the “hall” at 86th & Bishop my grandparents attended. It was also my Dad’s home church for at least twenty years of his life. I was there for a memorial service, but couldn’t help reflecting on these family stories as well. Years later, Janet Christie, my grandmother, said “There are no tragedies in life.” She trusted that every part of her story was within God’s plan for her life–and ours. Were lustered with His love! P.S. Immanuel’s Land actually has nineteen stanzas. It was written by Anne R. Cousins in 1876, using letters written by a Scottish pastor, Samuel Rutherford (1600-1661.) Read his story here. Did you learn Romans 3:23 as a child? 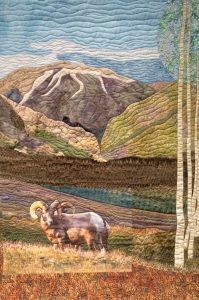 “For all have sinned and fallen short of the glory of God.” I learned a new way of falling short this week–in weaving. Actually, I fell short a few weeks ago when I ran out of warp for the sampler I was making. I decided to make a second sampler, striving for perfection. My warp”fell short” again, but this time I decided to tie on more warp, a process NOT recommended by more experienced weavers on my Facebook Weaving group. I decided to ignore their advice and do it anyways. They were right, of course. I measured and cut 140 threads, each about 4 feet in length. one by one, I knotted an old and new string together and trimmed the knots. I re-established the tension on my warp and started weaving again. That seemed to work well until the knots started the process of coming through the heddles and reed. 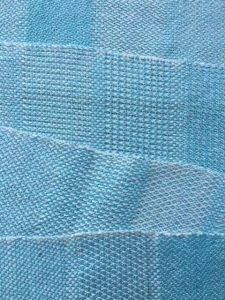 My fell line (where the weaving is actually done) started to wiggle and “smile”: the tension became uneven and my weaving was ragged. With every second treadle change, I was having to untangle threads from the back of the loom. 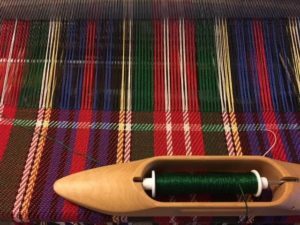 Finally I decided to pull the knots through the heddles and reed without weaving them, leaving a 10 inch gap in my weaving. It was difficult to establish a good tension after that, but I managed to get back on track. Then, I noticed that I was already running out of warp–again! I decreased the sample size—from 2 to 1 inches–and retied the back beam to get a few more inches out of the loom waste. I managed to eek out the last ten structures to complete my project. My finished product has an unplanned seam and a shortened sequence but, hey, its a sampler. It looks good and feels soft and wonderful. This picture shows a variety of the patterns in the sampler. I learned new tricks and now know more about mistakes to avoid in the future. 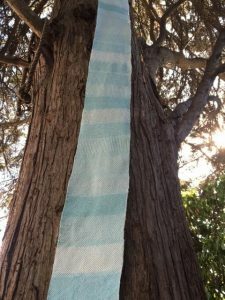 I’m ready to start my next project–sampler towels–which will add more color and practicality to my palette. I know that I will start with an extra, extra long warp. P.S. I’m pretty sure there is a spiritual application to this story, but I’ll leave it to your imagination and consideration. 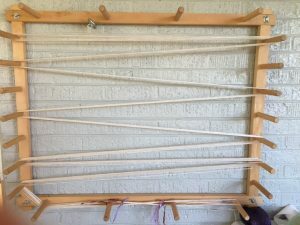 Here is my birthday gift: a used warping board bought on Craigslist, with a 9-yard warp for my next project. I really didn’t want to come. I’d signed up, paid my fees, and bought a plane ticket. Just ten days before John had decided that he would like to join me on the trip to Colorado and there was an extra room because someone else had to cancel. When John2 had another manic episode, I really wondered if one or both of us could/should go. I worked Monday, Tuesday and Wednesday and still didn’t feel like taking a trip, but decided to just follow through regardless of feelings. 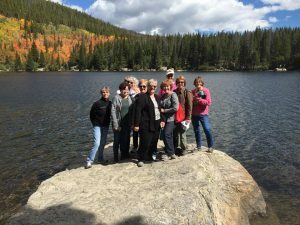 Our West Sub class of 44 graduates (1976) had voted to have this reunion in Colorado for a change. Only 13 ladies made the trip, less than 1/3 of our class. 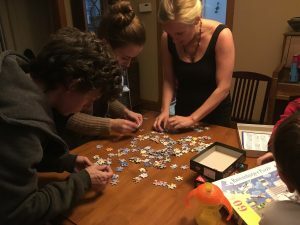 Illness, grandbabies, and other travel prevented many from making the trip, as well as some whose memories of nursing school aren’t all that fond. But the weekend has been sweet. We’ve laughed and talked through three meals a day and evening sessions focused on the past, present and future. We’ve driven together to town, and along the Trail Ridge Drive. 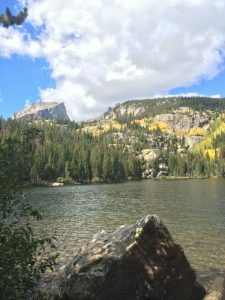 We took a short walk around Bear Lake and huffed and puffed up trails in (literally) thin air. We even stopped to see a small display of National Park Centennial quilts. This morning, we sang a lot of old hymns and songs from the 70s, our older voices stretching to hit the high notes (plus John’s bass.) We prayed and shared and had Cheryl Fornelli tell us a story* from John 11. I came reluctantly. I leave blessed. So here’s the lesson: Grab whatever opportunities you have to reconnect with classmates, extended family, and friends. It’s a little taste of heaven. *Cheryl uses a method called Orality, which uses oral storytelling to teach the biblical narrative. She and her husband, John, have been using this as an evangelistic tool in many cultures. Follow the links to learn more.